Autographs are not only one of the driving forces of the card hobby, but memorabilia as a whole. Photos, toys, letters, napkins, cars - you can find them all signed by different dignitaries and people deemed significant (or, in the case of Allen & Ginter, dogs and monster trucks count too). I keep the majority of the autographs I pull in my personal collection. And if I don't I try to trade them for other autographs. I don't know why I like getting the signatures, but it's probably like most everyone else: it gives me a connection to the people I watch on TV and, to a certain extent, wish to be. I'd have loved to have been given the gift of playing baseball at a professional level. Heck, I'd have loved to been a Little League All-Star. Alas, I wasn't so there's probably some part of my subconscious that's jealous and wants to revisit that envy through my autograph collection. Consciously, I just think that scribbled names are cool. A few days ago I was busting some junk packs I bought cheap in hopes of getting a solid start on a base set. I had no expectations of getting an autograph or some fancy insert. The price I paid was one where I'd have been happy with a truckload of commons. This particular pack: 1997 Stadium Club Baseball Series Two. I'd gotten a lot of about 15 packs and was busting away when all of a sudden I stumbled across an autograph. After about a second it hit me, "This is Stadium Club. The only autographs are Co-Signers." So there were going to be two signatures in this here pack. MARTY CORDOVA! The bold and exclamation points are because I just went in a time machine back to 1996 when this guy was the reigning AL Rookie of the Year and a run-producing machine for the Twins. Set that time machine to today and he's merely a footnote in baseball history. Flip this bad-boy over and who's next? RONDELL WHITE! 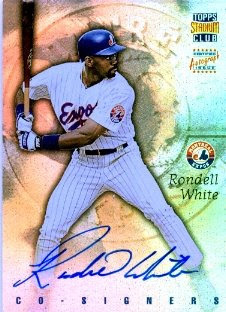 White was another in a long-line of "can't miss" outfielders produced in the Montreal Expos system during the late-80s through the mid-90s: Larry Walker, Marquis Grissom, Moises Alou and Vladimir Guerrero to name a few. White failed to turn into the superstar the Canadian media pegged him at, but he was a dependable bat who lasted as a journeyman until last season. So maybe neither of them are headed to Cooperstown but it's still an instant addition to the Expos collection. Even though I have a couple of White autographs already, this one's my favorite and there's a couple of reasons why. The first being that it's got too much of a story behind it seeing as how it has autographs from two guys who didn't pan out yet still showed some fire. Second, the design is gorgeous. 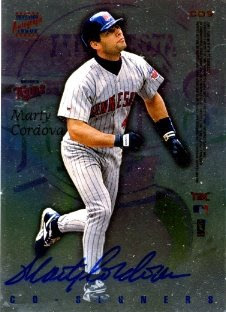 I do prefer dual autograph cards to have both signatures on the front of the card like Stadium Club opted for in 1998, but the bright side of this design (no pun intended for the holo-shininess) is that you can display White if you're an Expos fan or Cordova if you root for the Twins. It's not very often you see such nice signatures from current players. Often it's a scribble and a loop or two and that's about it. While these cards still offer a connection to the player, the asthetics aren't always there. Combine the legible writing with the sharp, thin-tipped pen and this "common" Co-Signers card is not only a great addition to my Expos collection but it's also an example other signers in all sports could follow, not to mention my doctor.